We are busy with our year 1 comprehensive groups around here. So, regrettably, this week’s Monday post is a day late. Keep an eye out for today’s actual post to appear soon. Congratulations to Chris Rivet from Eagleville, MO whose video and comments about using technology in a secondary science class were posted on the PD360 blog site for the October 17 : http://www.teachingstrategiesblog.org/blog.php?id=44. Libbi Sparks from Independence, MO will be featured in an upcoming blog segment on using technology in a secondary mathematics classroom. We will post the link as soon as it is available. 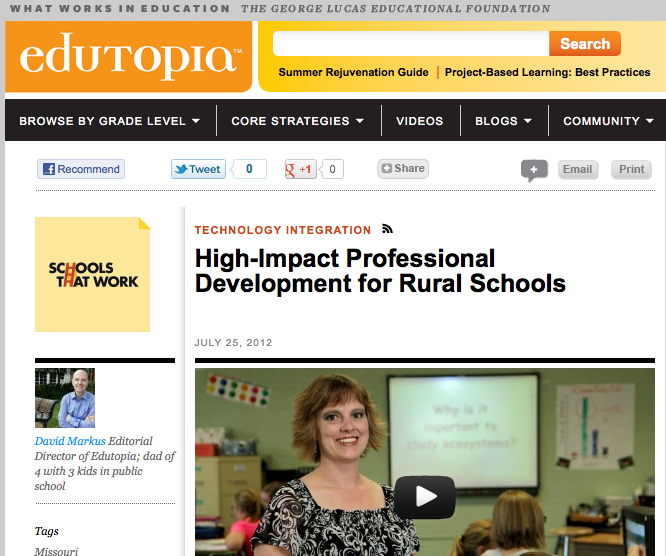 Many of the PD 360 videos about technology integration were filmed in eMINTS classrooms. PD4ETS participants and certified eMINTS Instructional Specialists have access to all PD 360 videos for use in eMINTS professional development sessions. PD4ETS participants and graduates will find more information and access to PD360 videos in the FY12 Moodle course for facilitators. PBS Channel 9 – KETC – St. Louis Invites Participants in American Graduate Broadcast: The national launch of American Graduate: Let’s Make It Happen will occur in St. Louis on November 7 at 7:00 p.m. with the live broadcast of an American Graduate Teacher Town Hall moderated by Gwen Ifill, senior correspondent for PBS News Hour and moderator and managing editor of Washington Week. For more information or to register to participate see: http://americangraduateteachertownhall.eventbrite.com/ PBS stations in Alabama, Philadelphia, and 18 other states are also participating. These sites are about the book “Curious George” and author H.A. Rey. Biography of the authors, reviews of the book, discussion questions, lesson plans, games and circus activities are included. There are links to eThemes resources on Chimpanzees and Circus Acts and Animals.